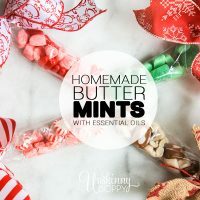 Easy recipe for homemade butter mints using peppermint, cinnamon and spearmint essential oils. You could also use caramel extract. These are better than the ones at wedding receptions and fancy restaurants! Whisk together softened butter with powdered sugar, 1 cup at a time, until fully incorporated. Add milk, 1 tablespoon at a time, until it forms a nice soft dough ball that you can easily form with your hands. Divide dough into 4 equal sections. Roll out into a "snake" and cut into ½" pieces to resemble a butter mint.